Here at Alden, we are hearing from many utilities that they are receiving a lot of attachment requests, and also a lot of general inquiries (without a request), regarding small cell and DAS deployments. How are small cell attachments different from other typical attachments? Dianne: Small cell attachments are different from traditional attachments in that with DAS and small cell, there’s a lot more engineering involved on the utility pole owner’s side because there’s a lot more equipment involved. Other [traditional] attachments are just cables - maybe with a horseshoe to help with sagging from pole to pole, but the equipment is minimal. Most utilities and other pole owners will only allow one small cell attachment per utility pole because there are at least four pieces of equipment just for one small cell attachment. There isn’t enough room on the pole for more than one small cell attacher. What equipment is involved in small cell and DAS attachments? Dianne: There are a lot of different methods for attaching small cell or DAS. In my area, a cantenna is a common way to deploy small cell. A cantenna is a can or tube that houses a small cell antenna, power source, strand equipment in conduit, and any other related equipment and is installed at the top of a utility pole. Another way to attach is to do a strand-mount, where the small cell equipment is attached directly to the wire hanging between two poles. There are other ways to mount small cell too, but generally the necessary equipment remains the same. Head-end (for DAS only): This panel is an interface from the antenna system to the service carrier, and is bolted onto the pole at its base. We are also hearing that wireless carriers and their contractors are reaching out to asset owners with informal requests for information about potential attachments on certain poles. These are not attachment requests, but more of a request for information to the asset owner of the provider’s intention to possibly submit a small cell attachment request. It’s time-consuming for asset owners to respond to requests for data about their assets, when that data may be out of date the next day if another attacher actually requests to attach and begins the permitting process. What kind of data should asset owners have at their fingertips to respond to small cell inquiries? Who owns the asset: Who do they need to contact for information about the asset and to submit attachment permitting? Asset type: Is the asset a utility pole, street light, street light, etc.? Asset height: Small cell rely on radio frequency, which are easily disrupted by buildings, trees and other physical structures. The higher up they are, the more consistent the signal is likely to be. Location: This is usually given in latitude/longitude coordinates. Pole owners are typically requiring the carriers to do their own upfront legwork. 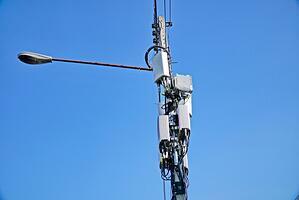 So for example, a carrier will select an area to deploy small cell. The carrier will hire a third-party contractor to go to the location and drive around to get a feel for the layout. Material: Is the pole made out of wood, aluminum, or fiberglass? Number of existing attachments: This tells what the expense may be to attach. Power availability: Small cell attachments require power. So, for example, telephone poles that don’t have power running to them wouldn’t work for small cell. After the carrier has submitted a permit to attach, they need to perform a load analysis if they want to do a strand-mount or if the asset owner does not already have load analysis data for that particular pole. Pole owners that don’t have current asset data may require carriers to do their own boots-on-the-ground research. Then the asset owner must verify the data the carrier finds. It’s a lot of back and forth. Asset owners that have accurate data about their poles that’s easily accessible are going to be a step ahead of the rest. It will just be that much easier for them to respond to a lot of incoming requests from wireless carriers as they ramp up their 5G preparations with small cell and DAS deployments. If both asset owners and attaching companies were on the same page with small cell, the anticipated increase in attachments could run smoothly. From learning small cell basics to considering if the attachment is a good fit for the asset, there are many ways the joint use community can prepare for increasing small cell attachments and the anticipated 5G. We would love to hear your comments related to small cell and DAS. What is your experience so far with this type of attachment? What are a few ways you think the joint use owners and attachers can do to prepare for the future? Help us start a dialogue within the joint use community.